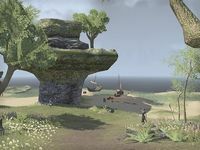 The Maormer Invasion Camp is a small camp in southern Auridon, on the coast west of the city of Vulkhel Guard. It is the base camp for the Maormer invasion of Auridon. They are using the camp to plan an attack on Vulkhel Guard. It is also the location of the buried treasure described by a treasure map. Unaccounted Crew: Help track down a captain's missing crew members.